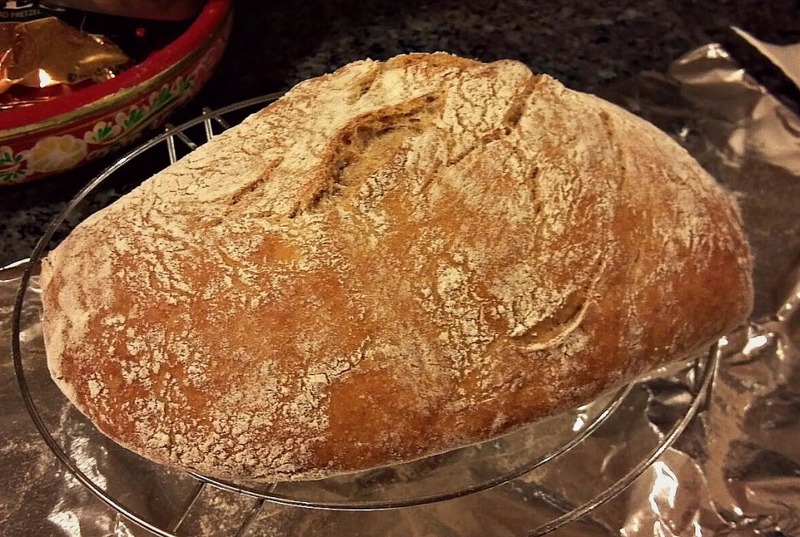 Homemade Bread: it just can’t get any better than that! There just is nothing quite as homey and comforting as the smell of bread baking. It’s even been recommended to bake some bread before you show your house if you’re trying to sell it, but why wait for THAT excuse to bake bread? You can do it with sure success with a few essentials – some you may already have in your kitchen, and one or two that might just bump you up to expert bread baker. Cook’s Illustrated / America’s Test Kitchen has re-issued their fabulously simple No-Knead Bread recipe in a recent special issue on bread, and you really should try it if you love crusty, artisan-style bread, with its open-crumb texture. It’s so simple, and SO successful. 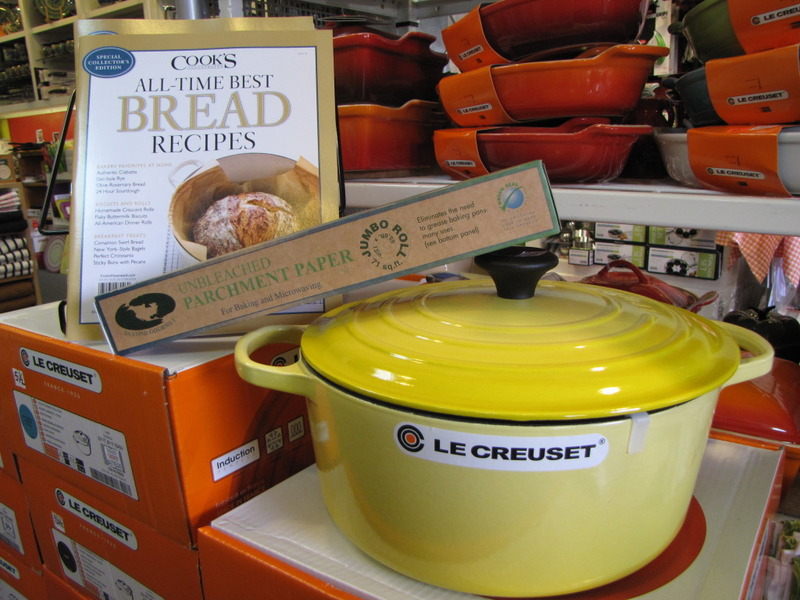 It makes a steam oven out of a cast iron French (or Dutch) oven, such as the Le Creuset ovens we have carried for years. The idea is that the preheated pot, with the lid on, can keep the temperature around the dough much higher; the higher temp’ makes the dough form larger bubbles inside; the steam created inside the pot condenses on the surface of the dough, making the crust crispy when the lid comes off for the final baking. The folks at ATK are right on! Mix your wet and dry ingredients, and let them rest and rise for 8-18 hours (your convenience). Knead the dough 10 -15 times and shape into a ball. Let the dough rise on a piece of parchment paper, covered with plastic wrap, for 2 hours. While the dough is rising, preheat your oven, with the cast iron pot in it, to 450 degrees. Place the ball of dough into the preheated pot, using the parchment to lift it carefully. Put the top on, put it in the oven, turn the heat down slightly to 425, and bake for 30 minutes. Take the top off and continue to cook until brown and crusty – or until 210 degrees inside the bread. 6-8qt heavy pot with tight-fitting lid. We, of course, love the LeCreuset round ovens…. Only Le Creuset’s signature phenolic knobs and stainless steel knobs are oven-safe at high temperatures. Classic phenolic knobs are oven-safe to 375 F. If using a Classic oven, remove the knob when baking at temperatures higher than 375 F.
A thermometer…….optional but handy. Once again, the internal temperature of the loaf is what really determines if it’s ready to come out of the oven. A fast-reading instant read thermometer is invaluable for bread baking. The best of the best is of course the Thermapen from Thermoworks. But we have many others – digital and dial. A Brotform, or banneton…….If you are not familiar with these, read on. These hand woven (following a century-old tradition) bread-dough-rising baskets give your homemade bread a crunchy crust, improved texture, ribbed, floury décor, better rise and a uniform shape. 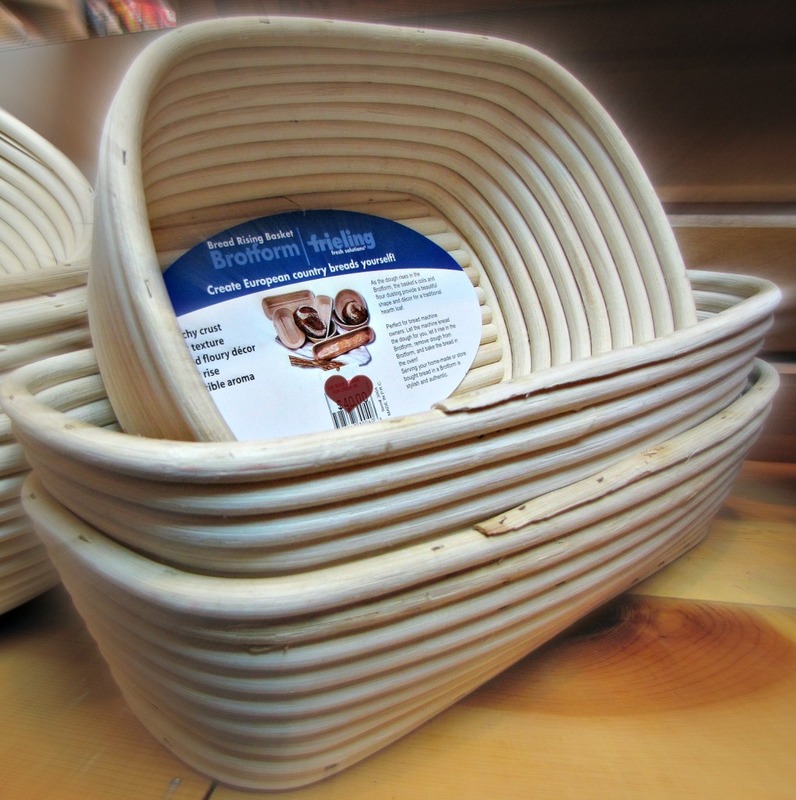 The baskets are used to support the shape of a loaf leavened over a long period of time, as long rises may weaken the gluten structure of the bread, resulting in a flatter loaf. To use, just dust the basket with flour, put your kneaded dough in, and let it rise. The natural cane coils shape and decorate the loaf the old-fashioned way. When it’s done rising, the loaf is turned out and immediately slid onto a stone (or into a pot) and baked, scored or not. The final result? A country bread with a great texture and crunchy crust. To remove any remaining flour, simply tap the basket on the counter. This sturdy basket is even attractive enough to double as a serving piece for outdoor meals and entertaining. Brotforms / bannetons can be used for years and never cleaned. If they build up too much flour, use a paring knife to scrape out the dried bits in the grooves and start over. It is kind of like seasoning an iron skillet; if you don’t get it wet, and reuse it with the flour in it, your bread will stick less and less each time, until you can simply invert the dough with no coaxing. This allows you to bake using much wetter doughs. You may also hand wash in warm water if you so choose. 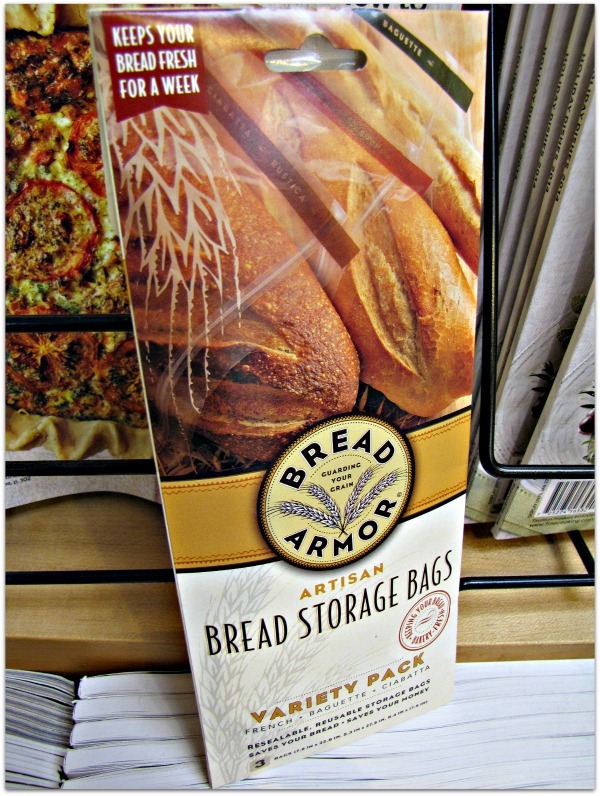 And finally, to store your fresh bread we recommend the Bread Armor Artisan Bread Storage Bags. These bags are resealable, reusable and recyclable! Bread baking at home is definitely worth it. So start experimenting, and if you need any tools to help you in the kitchen, we’ve got you covered. Enjoy your homemade bread, because it just can’t get any better than that! Have you ever wondered how they get those perfect little cubed vegetables at restaurants? That’s right. They use a “mandoline”, a cooking utensil for slicing and cutting juliennes and often crinkle-cuts. All you do is carefully slide the foods you’d like to cut along the adjustable surface, and Voila, the mandoline slices it and lets it fall. It also can slice, waffle cut, crinkle cut and dice firm vegetables and fruits. Mandolines provide a wonderful alternative to “doing it by hand” and easily turns fruits and vegetables into uniform slices, or julienne sticks of almost any thickness and size with speed and precision. 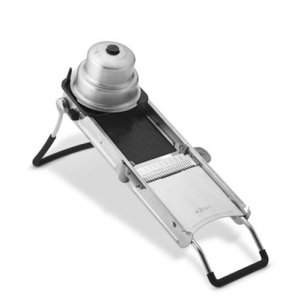 It’s safer to use than a handheld slicer because it has legs for added stability. And don’t forget the mandoline’s inimitable talent: crinkle and waffle cuts. 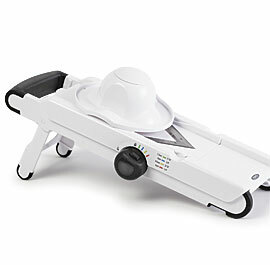 Kyocera adjustable slicer: Slices only, but easily adjustable to 4 different thicknesses. Easy to use and was the darling of my demo at the Ephraim Moravian Church Women’s group this spring… Dubbed “the no-setup-mandoline”. 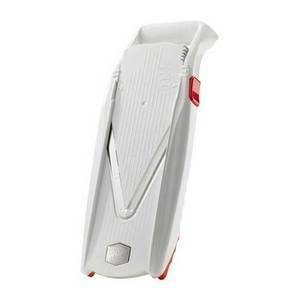 Ceramic blade that is razor sharp. DeBuyer Kobra: Slices. 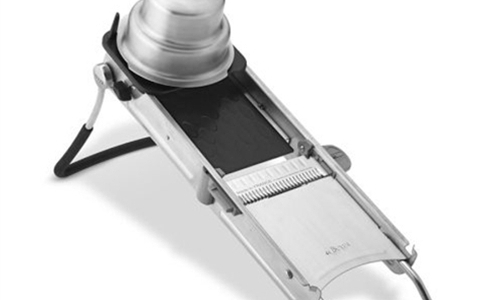 Offers superior performance with tomatoes and the depth adjustment knob gives you continuous adjustability. OXO V Blade: Slices & Juliennes. Four blades and a simple height adjuster make straight slices, crinkle cuts, French fries and julienne strips in a variety of thicknesses. Borner V-Power: Slices, juliennes, dices. DeBuyer Ultra: Slices, juliennes, cubes and even makes diamond shaped “cubes”.